Mumbai has a tropical climate – typically, a tropical wet & dry climate. If you were to ask me, the city experiences two seasons – the ultra-wet monsoons and the smoking hot summers! June to September is the wet season, whereas December to February is supposed to be a cooler season, but in truth is just as hot as the summers during the day (with some respite after the sun goes down). The average annual temperature is ~27.2 °C, but expect temperatures to be in the high 30s when the sun is out, though it rarely hits 40. The best times to visit Mumbai is probably in the apparently cold period of December to February, when you will at least have some respite during the nights, and it won’t be quite as humid as the rest of the year. Mumbai houses the country’s second most busiest airport – Chattrapati Shivaji International Airport. Geographically, the airport is located quite centrally (albeit in the suburbs). It is extremely well connected to the main city and neighbouring suburbs (where you’re likely to stay). Pre-paid or post-paid cabs are available as soon as you walk out of immigration. If you feel truly adventurous, you could also walk out and hail an auto-rickshaw – the three-wheeled wonder that plies its trade in the suburban region of the city; though I’d recommend you leave this adventure for a later date when you do not have your luggage to worry about. If you choose to hire a cab by meter, it should never cost you more than 500-600 INR, which should be enough to take you all the way to Colaba, which is the southernmost point and the main tourist district. The streets of Mumbai are more complex than many metropolitan cities you visit, and although the people are generally helpful & kind, if you are unfortunate, you might find a deceitful cabbie that runs you in circles before getting you to your destination, just for an increased fare. Mumbai is extremely well connected by rail & road domestically with multiple govt. run trains running from all parts of the country and countless bus-services providing daily service by the dozen. 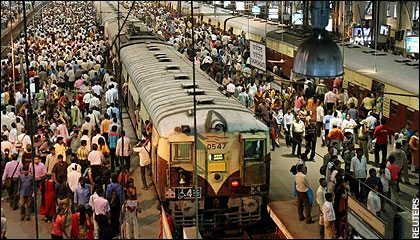 Mumbai’s Local Trains at Peak Hours! For all its crowdy splendor, Mumbai is a ridiculously expensive city to live in as far as real-estate goes. In fact, it is considered to be amongst the most expensive cities in the world to live in on a GDP per capita basis. Budget travelers in particular can expect to have a hard time finding decent but affordable accommodation. Mid & upmarket places too, relatively cost a little higher in India than some of the western countries. South-Mumbai, including areas like Colaba & Marine Drive, which are usually frequented by foreign tourists, are extremely expensive. As a general rule, the further south or the closer you get towards the sea front, the more you will pay for your bed. Look for couch-surfing opportunities particularly in the western suburb of Bandra, where if you are lucky, you might just get to stay with a charming little Catholic family in a lovely little bungalow/duplex. There are some great recommendations here, otherwise there’s always booking.com. In general, you could expect to spend anywhere from USD 15 – 80 per day per person on your accommodation (including upmarket accommodation). Auroville – A Hippie Paradise or a Place Ahead of its Time? We have not been to India or Mumbai yet. Would love to visit this city, it looks amazing and is so big and crowded! 20 million people on 603 sqkm!! That is crazy! Back home in Norway we are a total of 5 million people on about 385000 sqkm! 🙂 We are currently in Indonesia, thinking about where to go next. India just climbed high up on our next-to-visit-list :). How many days would you recommend us staying in Mumbai? The last time I was in Bombay was about a year ago. I want to go back… love the city for its energy! This is still on my list of places to visit – hoping to get to India in the next couple of years – so I will remember that it is an expensive place to stay. Perhaps for a night or two I could stretch the budget! I remember the crazy traffic and being nervous to cross the street that we ultimately decided just to keep to our side of the street! Want to go there so badly! The subcontinent and its volume of people is always staggering! I’ve never had the pleasure of visiting India (however it is one of Sarah’s favourite countries), however I think I can imagine the sheer volume having visited Bangladesh a few years ago! 20 million people? There are only 5 million in Scotland – cannot comprehend this!! I actually really enjoyed this little read…..very well written. I would love to visit Mumbai, probably will one day. I like both the beautiful outdoors as well as the hustle and bustle of a big city… In fact I think you can find quite a bit of culture in these cities….The modern world with old world beliefes meshed into one..sounds cool. Seems to be interesting…I really enjoyed this little read!!! very well written.